몬트리올, 캐나다의 알렉산드리-몬트리올 | 호스텔월드에서 예약하세요. Cancellation not possible for the deposit and 1 weeks before the arrival time for the balance. A non-refundable deposit of 50% is required to reserve. (10% is charged by HostelWorld when reserved online and 40% is charged by Alexandrie). The balance must be pay 7 days before arrival. After that there is no possibility to change the guest number. •	Guests must present a valid credit card upon check-in to cover incidental charges and the security deposit. The Front Desk will run authorization on your card so your bank or credit card company may reflect this by temporarily reducing your available balance or credit limit. It is not a charge. The authorization ensures that the card is valid and will be released 5 to 10 days after check-out, provided there is no damage, missing inventory, room charges, or excessive cleaning required. Amount authorized at this property: CAD$100.00 per night and per room or dorm. •	Smoking Policies : A minimum of CAD$ 200 for deep cleaning fee will be apply if anyone smokes in the room or dorm. 번역 이 호스텔은 위치와 편안함을 모두 최선을 제공합니다. 그것은 가까운 올드 타운 지구, 라틴 쿼터, 차이나 타운 등 관광 명소에, 액션의 중심에 맞다. 멀리 모든 단지 돌을 던져 멋진 레스토랑과 바도 있습니다. 와이파이 및 세탁 서비스이기 때문에 아침 식사는 숙박 요금에 포함되어 있습니다. 심지어 시내 전화는 당신에게 어떤 추가 비용이 없습니다. 부엌은 세 냉장고 거대하다, 그래서 당신은 저장 공간과 투쟁하지 않습니다. 장기 투숙객을 수용하기위한 알려진, 그들은 따뜻한 환영 분위기를 연출에 큰 있습니다. For 17 years, we've been building a real hostel that fulfils the backpackers needs : Without big publicity, people chose us because they looking for an hostel experience. We proud to say that we are not an hotel or a bar. Night life in Montreal is fantastic. We don't need a bar in the permis. Your beer will be cheeper if you buy it at the convenient store. We go out evry night enayway ...come with us. On the contrary, our commun room is a big industriel loft furnish with recycled furniture. For us this give a homy style and made people comfortable. Look at the picture and read the description before booking. Look also at our review number (2300). This is our succes reward and your best guaranty. 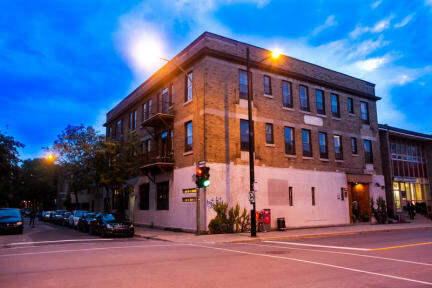 We think a hostel in Montreal should offer a vibrant style that surprises but comfortable and good prices. Value for money: very good. Security: dorm lock with magnetic key and lockers in each room. Location: Easy, 5 streets from bus station also a stop for airport shuttle. Free parking on street possible. Facility: large kitchen with 5 fridges, roof terrace and a relax lounge in basement open 24 hours . Save money - cook your own meal and buy your own beer . There is convinient stores near the hostel. We're very proud of our new ensuite dorm (with bathroom); Those rooms have air conditioning and are the nicer in the building. According to our user-pay principal, if you wish more services choose the most expensive dorm. We also offer no-frills dorm with a shared bathroom (gym style) for cheap cheap price. Only for laid-back people on lower budget. Give us a try. If you don't like it we will give you back your money. Our private double room is much like sharing an apartment; this room shares a living room, kitchen and bathroom with just one other room. Everything is around us: the arts and entertainment district, the financial district, Old Montreal, the Latin quarter, McGill campus, and Chinatown. The hip restaurants, bars and shops are within walking distance. We're also near the bus station and metro... save on bus passes and taxis! Several grocery stores/markets are in our area as well. The staff here knows the city very well and will ensure that you get the most out of Montreal without breaking the bank while seeing things that might not be in any guide books! Alone or with a group or family we have a room or apartment for those on an economic budget. - We do not accept residents Montreal region and suburbs and ask for a credit card (exception: new immigrants). - Kids are not allowed in the dorms. - Non-smoking (any kind) except special place on roof terrasse. - Our reception is open until 11pm. We do not accept any reservation exceeding this hour, Customers have their keys. - For any change or cancellation, you must notify us at least 1 day in advance before 16h, otherwise the first night will be charged. - the price does not include local taxes about 15%. - For a group of 8 peoples or more you must comply with our group policy. So nice ppl at the hostel ! Friendly, Kind , Fun! also Location is nice too. 추천이에요! 직원들 너무 재미있고 잘챙겨줘요! 일단 저는 6인실을 선택했는데 운좋게 안쪽에 있는 침대방로 들어가서 2인실이나 마찬가지인 룸에 들어갔어요! :) 침대와베게 시트 그리고 담요도 제공해줬어요! 직원분이 차근차근 게스트룸 사용방법에 대해 친절히 차근차근 설명해 주셨고 방은 2층이었는데 계단도 높고 짐이 무거웠는데 방 안까지 들어다 주셨어요!! :) 욕실은 그닥 좋진 않았어요 방안에 있긴 했지만... 시설이 좀 낙후된 느낌이구 물세기도 얕았던... 아쉬웠어요 주방은 1층에있었는데 오픈된주방이라 누군가 요리를 한다면 다 알수 있는ㅋㅋ 그리고 위치는 역에서 한 10분 정도 거리였고 버스터미널은 한 5분~7분거리에 있어요. 주변에 대형마트가 있어서 요리할 재료를 사시긴 좋습니다 그리고 음식점도 꾀 많아서 좋아요! 푸드코트도 있고! 조식은 기본적인 빵류와 커피 우유 정도였어요! locations is pretty far from downtown and Washroom is in basement. That was disappointing . But atmosphere was awesome and staff is so kind.